Last week our office and the Governor’s Council of Economic Advisors had our annual off-site meeting where we get out of Salem and into a regional economy to learn more about what’s going on. This year we were in Hood River where we had two great panel discussion on housing and tech (the thriving unmanned aerial systems cluster), in addition to two business tours in the afternoon. What follows is a summary of the discussions. All errors in terms of relaying information, or interpreting comments are mine. First we had housing panel which included: Maui Meyer, a realtor, restaurant owner and former Hood River County commissioner; Nan Wimmers, a realtor and president of the Oregon Association of Realtors; Dustin Nilsen, City of Hood River’s planning director; and Tom McCoy, a farmer, Sherman County commissioner, recovering economist and member of the Governor’s Council of Economic Advisors in the 1990s. Like everywhere, housing affordability is the biggest issue in recent years. The region has underbuilt housing relative to population growth since the Great Recession. This dynamic, unfortunately isn’t unique to the Gorge. That said, Hood River is in the 99th percentile nationwide for the worst affordability among rural counties. That means only 1% of all US rural counties have higher home prices relative to household incomes. 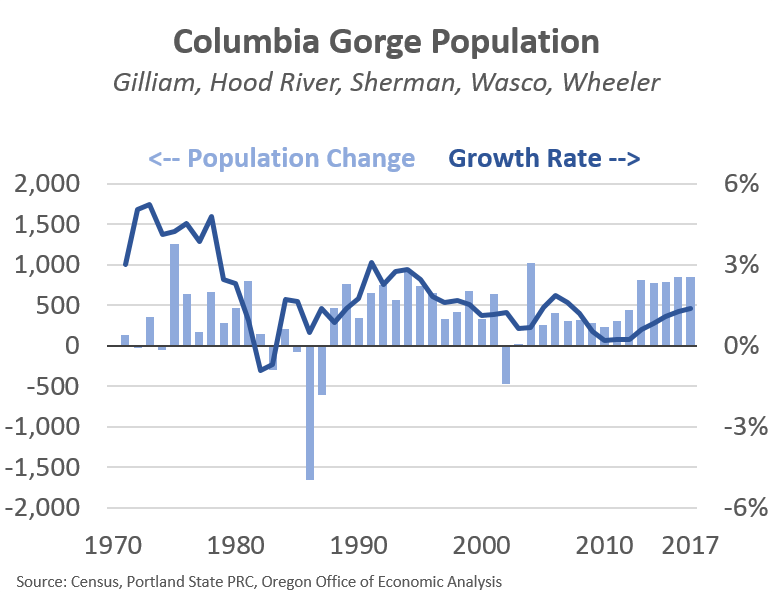 The rest of the gorge doesn’t fare much better as Wasco is in the 93rd percentile, Sherman in the 90th, Wheeler in the 86th, and Gilliam in the 68th. The affordability crunch and lack of available units has pushed people to search in other areas of the gorge. If housing is unavailable in Hood River, people are moving to The Dalles, and from there to Biggs, Moro and other small towns in the area. Vacation rentals and second homes are additional hurdle in the gorge. While the region has underbuilt housing relative to population growth in the past decade or two, when you factor in these second homes the ratio is even worse. To be clear, the housing imbalance is due to a supply side problem of not enough construction, not that demand is too high or population is increasing faster than it typically does in expansion. While the above is true pretty much everywhere in Oregon, there were a few items in particular that stood out in the discussion. One, the City of Hood River recently passed restrictions on short-term rentals. Only primary residences can be rented out short-term, and only for a set number of nights per year. Second homes are not allowed to do short-term rentals, at least within the city limits. This will be something to monitor moving forward in terms of the rental housing stock, and how these policies impact available units for residents, and how it may or may not curb second homes in the area. Two, the issue of effective land supply versus what land is actually zoned on paper is an issue. Now, I hear this issue throughout the state as well. But in the gorge they are going parcel by parcel and figuring out what can realistically be developed in the near future. Some big issues are large tracts of land zoned for housing (either single family or higher densities) but they remain as farms today with no plans to redevelop. This, in essence, means just looking at zoning overstates the true, effective land supply in the region. To help address this issue, Hood River included an amendment to their housing/land use work that looked just at this effective land supply, which showed a larger need than if they only looked at a current map of zoning. As a result they do have a multi-pronged approach that includes rezoning (upzoning) and more new construction. Will be interesting to see how this plays out moving forward and to what extent getting at the true, effective land supply helps planning, construction, and affordability moving forward. Three, Sherman County now has a partial renovation payment for people who come in and fix up rental properties in the county. As is seen elsewhere in the country where the housing stock was built for a larger population, there are numerous older units that are falling into varying stages of disrepair. Sherman County’s population is largely flat in recent years, but down over the past couple of generations. It is down enough that they are worried about the viability of the grocery store. So providing an incentive program to help increase the useful housing supply, and provide a place for new residents to live certainly seems like a smart strategy. The program is modeled after a similar one in Morrow County. This is the first I’ve heard of these, and looking forward to seeing the outcomes moving forward. Stay tuned for Part 2 and the tech/UAS panel discussion. Thanks to the team for heading our way. We are passionate about this community and place we call home, appreciate you raising awareness of the issues we face, and collaborating on their solutions. Thanks Dustin. Great panel and insights. Really appreciate your time. If there is anything I mischaracterized, or that I overlooked. Let me know!